Updated: TerminalColors ‘updated’ for 10.5.2 compatibility. As mentioned on Ciarán Walsh’s Blog, the default blue background that’s being used for Leopard’s terminal is difficult to read on a black background. 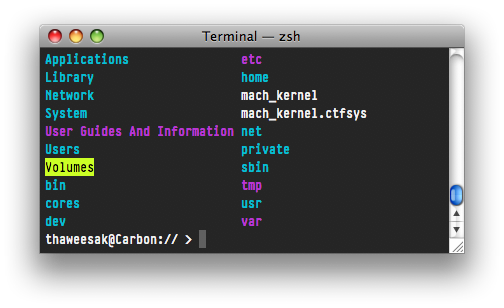 In order to customize the colors, you will need the SIMBL hack for Leopard’s Terminal. Here’s a screenshot of how it would look like on your Mac. 3. Install the Vibrant Ink for Leopard Terminal Theme. Download link is in the box.net widget below. 5. Voilà! You’re done! Your Terminal should look something like the screenshot above! I use Pragmata font in the screenshot above, so feel free to change the font to what you heart desire. thanks a bunch, using vibrantink on terminal and textmate..
any way to get colors into nano/pico ?